Last post I talked about the importance of teaching your child how letters make sounds to read, and how sounds make letters to spell, so they can begin to understand reading and enjoy writing stories. This post gives you tips on how your child can become a life-long reader. 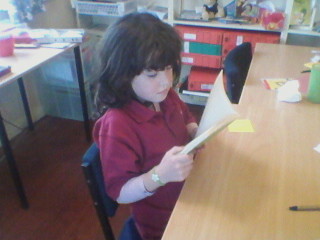 This student was taught phonics and learnt to read very quickly. Decide exactly what you want. Set clear and exciting goals with your child. The goals should be written as wishes. Exciting and achievable wishes that you both want to happen. You can both get excited about what interesting books they will soon be able to read and how easily they will read them. Look at this post and buy the short easily digestible coaching guide I wrote called Coaching your children to be excellent students: A practical guide for ways to set goals. When the reading goals are written briefly and simply and sound clear and exciting to both of you, you can decide together how you will achieve your wishes. Decide together how many times you will coach your child on reading, when you will coach, and what skills you will coach. Again there is information how to make agreements with your child in the coaching guide, this recent post, and in past newsletters. Be into teaching your child reading skills for the long haul. Make the reading coaching times achievable as though you are going to work with your child’s reading skills for longer than a few weeks and so need to pace yourself. Those families who pace the reading coaching succeed in walking steadily towards the reading goals they want for their child. Put the important things in life first. Teaching your child to read is vitally important! Teach them reading skills before that vacuuming, the phone-call to a friend, the television, and anything else that can be attended to at a later time. Put your child’s reading skills first and you will find the other things get done anyway. Teach reading skills in regular short bursts. 3-4 times a week for short periods (15-20 minutes a time) will mean your child makes rapid progress with reading skills. Short, regular burst of reading skills coaching from you help your child remember reading skills you have just taught, and use them in the next coaching session. Keep teaching reading skills when the going gets tough. Keep coaching reading skills to your child going when the honeymoon is over. I talk about ways to work with your child when they become reluctant in other blogs and in the coaching guide. You can also write to me if you have any questions and I promise to respond. I like to share my coaching ideas with as many people as possible, so please Tweet this post or follow me on Twitter and share this post and the excellyourchild.com website with other like-minded families. Posted by annethecoach on 7 June, 2012 in reading and writing skills and tagged coaching, helping your children, home schooling, reading, reading skills, respectful relationships with your child, teaching.